What is Staphylococcal Scalded Skin Syndrome? 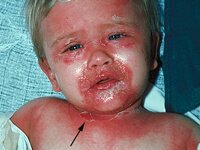 Staphylococcal Scalded Skin Syndrome (SSSS) is a skin disorder caused by two exotoxins released from the toxigenic strains of Staphylococcus aureus bacteria. The desmosomes are a part of skin cell that is responsible for attaching to adjacent skin cell. The toxins adhere themselves to a molecule within desmosome known as Desmoglein 1 and thereby break it up making the skin cells unstuck. The condition is characterized by painful rashes and easily-torn blisters. If the toxin is not removed by the immune system, it can circulate through the blood and infect most of the body surface. The clinical features of SSSS were first described by Baron Gottfried Ritter von Rittershain in the year 1878 who studied 297 cases of children being affected by this skin disorder in a Czechoslovakian children’s home and recorded them over a period of 10 years. The condition is mostly detected in children below 5 or 6 years of age, especially neonates. Application of lifelong antibodies against the staphylococcal exotoxins has reduced the chances of this skin disease greatly in adults and older children. Immunocompromized individuals or people having renal failure are as a group more prone to this disorder. Compared to other ethnic groups, the Caucasian people have a greater tendency to be affected by this disorder. Males are twice more prone to develop SSSS as compared to the females. SSSS begins from a localized staphylococcal infection that produces two causative exotoxins, namely, the epidermolytic toxins A and B. These exotoxins belong to group II, phage type of 71 Staphylococcus aureus bacteria. The exotoxins are encoded on bacterial chromosome and on a plasmid. They are proteases which cleave the desmoglein-1 that generally holds the spinosum and granulosum layers together. The Staphylococcus aureus bacteria produce a poison that lead to skin damage, thereby causing blistering and scaling of the skin. The epidermal layer of the skin gets detached by the breakdown of the tight junctions. Wrinkling of the skin that has a tissue paper-like look, followed by appearance of large bullae in armpits, groin and other body orifices like the ears and nose (nasopharyngeal infection). Spreading of the rashes to other areas of the body, such as the arms, trunk and legs. In newborns, the lesions are frequently found around the diaper area as well as in and around umbilical cord (infected umbilicus). Peel off in sheets of the topmost layer of the skin, thereby leaving a moist, reddish and tender surface. The affected children might feel feverish and miserable; they might also detest being held or touched. If larger areas of the skin are shed, patients would lose valuable amounts of body fluids and salts thereby developing dehydration. Further infections might also spread through to the bloodstream. The mainstay of SSSS treatment is eradication of primary infection along with supportive care. Patients often need to be admitted to a hospital, although in some cases treatment can be carried out at home. Parenteral antibiotics for covering Staphylococcus aureus should be given. Most strains of the S. aureus bacteria that are associated with SSSS have penicillinases, which make them resistant to penicillin. First-line systemic therapy involves administration of oral and/or intravenous flucloxacillin. The condition can also be treated with Nafcillin, vancomycin or oxacillin. Clindamycin can sometimes be used due to its inhibition of the exotoxins. Topical therapy can include usage of fusidic acid as the first-line treatment. Alternatively mupirocin can be used if there is bacterial resistance. Enteral nutrition should be commenced in case oral intake becomes unlikely. Analgesia might be required by the patient. Medical experts prefer an opioid infusion instead of non-steroidal anti-inflammatory drugs (NSAIDs) as the damaged skin surface is already vulnerable to bleeding. Oral morphine or paracetamol can be given to manage fever and pain. Renal excretion of these exotoxins makes it vital that the patient can make the maximum use of optimum renal functions. The moist, bare areas of the skin should be lubricated by using a bland emollient cream to alleviate signs of pruritus and tenderness. Careful handling is required to minimize skin trauma. Iatrogenic injury to the skin can cause unnecessary pain and may occur when anesthetic creams are applied beneath occlusive dressings before intravenous cannulation. Hence, it is best to apply these creams beneath an appropriate non-adherent dressing that can be aided by gauze or bandage, or a cling-film wrap. Moist compression helps in improving skin comfort. Emollient creams should be applied as long as the skin has healed fully, eventually feeling smooth and supple. Adhesive tapes should not be used under any circumstances. Physiotherapy is essential as SSSS normally tends to affect the limb flexures severely and the patients will intentionally restrict movement due to pain and discomfort. Supportive care can be given by administering fluids and electrolytes that helps in ensuring a rapid recovery. As this condition disturbs the thermoregulatory functions of the skin, monitoring the body temperature is essential at regular intervals. The ambient temperature of the room where the patient rests should also be adjusted accordingly. Infants might require a radiant heater panel or an incubator. Special treatment is required for a blood infection. Death can occur after severe infections. Most cases of SSSS are mild, and the prognosis for children affected with this disorder is excellent. A complete resolution of the condition can be expected within 10 days after the start of treatment without signs of any significant scarring. However, the outcome is poor in adults and rests on various factors like the duration of treatment, host immunity as well as other additional comorbidities. Mortality is low in infants (close to 4%) but might be significantly high in adults (67%). Outbreaks of SSSS may occur in a neonatal unit or a childcare facility. In such cases, investigations should be carried out to detect the staphylococcal carrier. Identification of the childcare worker, healthcare worker, visitor or parent infected or colonized with the Staphylococcus aureus bacteria is essential for the management of the problem. Once these individuals have been identified, they should be treated with oral antibiotics and/or mupirocin ointment to remove the causative organism. Any risks of further infections should be minimized by employing strict hand washing rules that use antibacterial soaps and/or alcohol hand rubs. These images depict the condition of the skin in patients affected by this disease. 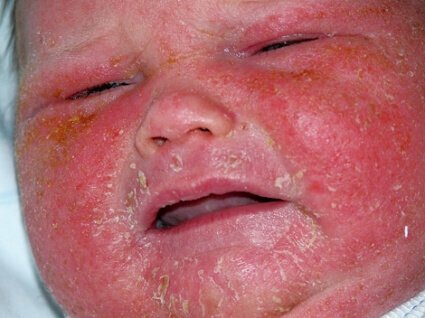 Staphylococcal Scalded Skin Syndrome responds well to treatment and patients can recover fully within a short period of time.